Installing a shower used to mean placing a showerhead over the tub and hanging a curtain. That simple setup is still right for many people. But if you’re looking for something more for your bathroom redo, you’re in luck. Today’s abundance of choices range from spa-worthy luxury, to simple and accessible functionality. Simpson Plumbing specializes in complete bathroom remodels and shower and tub installations. Contact us, and we can help bring your dream bathroom to life. Here’s a rundown of some of the most popular shower types. Does your home have a standard shower or shower-tub combo? You can keep your bathroom’s existing layout by installing a new, ready-made kit. Replacing an old tub or shower with fixtures of the same size is generally the most budget-friendly option. These practical showers come in square or rectangular shapes and a choice of colors. You’ll have a few different options for doors. Sliding doors or a curtain are the most common options. Most modern shower stalls and tubs are made of fiberglass and polyester. They’re smooth, easy to maintain and durable. We can help you choose the right model, or we’ll install a kit you’ve already purchased. You can upgrade a standard kit with your choice of fixtures and doors. Master baths often feature a separate shower enclosure and tub. A shower enclosure allows for more luxury and design versatility than a small shower stall. An enclosure can be a kit, custom built or a combination of the two. The advantages of a shower enclosure are the array of designs and options. Would you like a shower seat? Does more than one showerhead sound enticing? You’ll likely have lots of choices in doors, too. Glass doors, ones that slide or open out, are common. Enclosed showers can be great if accessibility is a goal. With low curbs, they are easier to get into and out of than a shower that’s built into a tub. Ready to step into opulence? 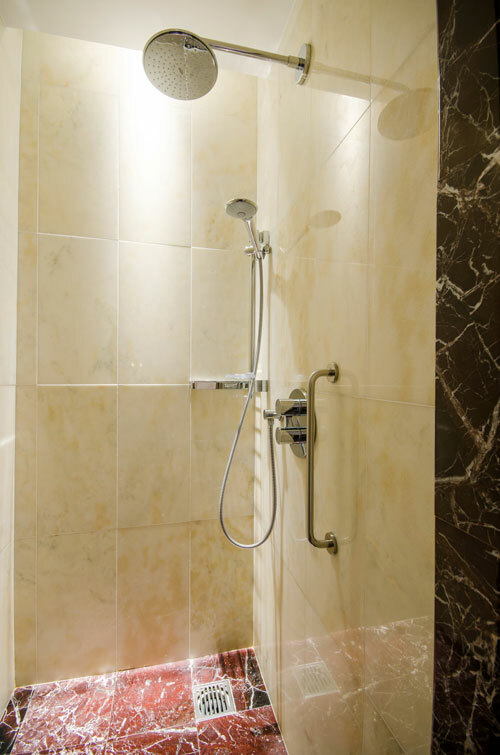 Walk-in showers are often considered the epitome of elegant design. They feature custom materials and layout. These showers have an open layout. They don’t have doors and may not have curtains. Some of these showers have walls made from glass blocks or tile-lined materials. A walk-in is roomy by design, so you’ll need to start with a large bathroom or plan to expand the area you have. Walk-ins contain water and spray through precisely graded floors and carefully designed walls. Besides being luxurious, a walk-in is also the ultimate in accessibility. A walk-in doesn’t have a curb and can be built wide enough to accommodate those who use a walker or wheelchair. When the rest of the design follows the tenets of universal design, showerheads, seats and storage cubbies can be built to be both beautiful and easy to use.